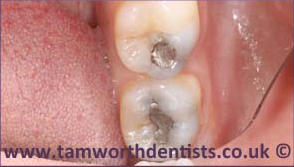 Amalgam are the traditional materials that were commonly used to fill any holes or cavities in your teeth. The two main downsides to these types of fillings is the fact that they contained mercury (which could pose a health risk if it leaks), and that they don’t look very appealing in the mouth. At our practice we are equipped to safely remove and dispose of any amalgam fillings you may have. We will then be able to carefully replace the holes with a more natural and friendly composite material, which also blends in with your teeth. Why Should I Have My Amalgams Replaced? 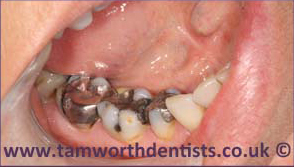 In modern day dental practices, there is a lot of concern and controversy that surrounds the use of amalgam fillings. This controversy has been heightened in certain Scandinavian and European countries, that it has even lead to being a banned filling. There is no conclusive evidence however, to say that you are any more exposed to mercury than you are in every day life. 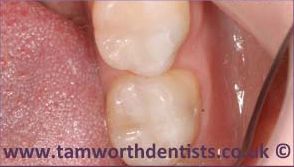 The majority of dentists in the UK will offer a combination of both amalgam fillings and white composite fillings. 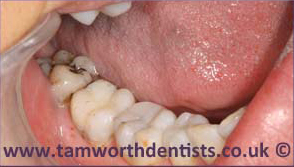 At Tamworth Dental & Implant Clinic we are a strong advocate of white fillings over amalgam. If you are looking at getting your amalgam fillings replaced, please do not hesitate to call us and book your free consultation today.